Downtown Los Angeles now has Executive Chef, Founder, and restaurant entrepreneur Jimmy Shaw’s Loteria Grill. Always thinking ahead, he built a Mexican sandwich Torta Company next to his signature restaurant to serve warm and tasty fare. For those who read my review of Loteria Grill – http://dineandtravel.wordpress.com/2013/09/26/authentic-mexican-cuisine-in-la, you will understand why this affable chef is one of my favorites. 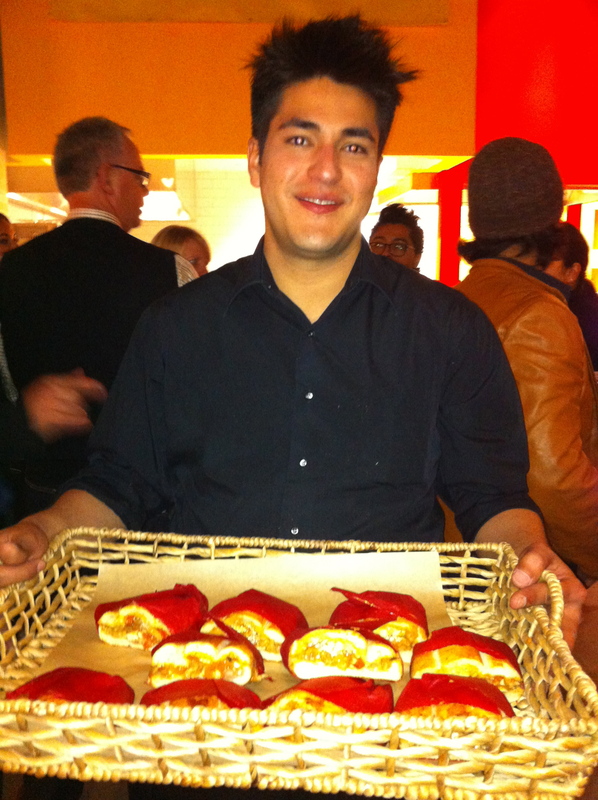 On Friday the 13th of December, I attended an Opening Night of Torta Company and Loteria Grill. 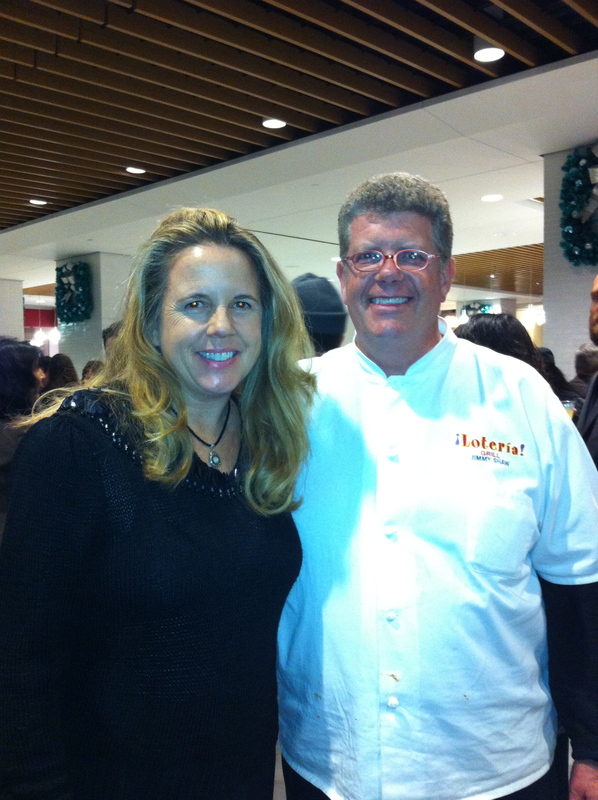 I was excited to try his new restaurants at FIG at 7th. Located on the first floor inside TASTE, it’s a gourmet food court. MELT is across the way serving up epicurean grilled cheese sandwiches. I was happy to also see Le Cordon Bleu-trained chef, Joe Kim, open a Flying Pig inside this new development (Read my review of Flying Pig – http://parklabreanewsbeverlypress.com/news/2011/07/flying-pig-cafe). Kim told me that his Flying Pig has been open for four months. We were led into the TASTE to the makeshift bar, not everything was up and running yet at this clean and brand new gastronome. Jalapeño, Tamarind and traditional Margaritas were being custom-made for the 100 guests. Sous chefs were making Shaw’s famous soft tacos with chicken mole poblano, carnitas en salsa morita, and papa con rajas with creamy potatoes. We nibbled on each of the authentic tasting Mexico City-style tacos before the Tortas arrived. Served wrapped in paper and hot off the grill, Shaw and his brother served up one of the most unique tasting sandwiches I have ever had. They are divided into categories: Vegetarian, Chicken/Turkey, Fish, Beef, Pork and my favorite La Cubana. Chef Jimmy Shaw’s brother Andrew Shaw created this tasty torta. Imagine black beans spread on authentic Telera rolls fresh out of the oven, and topped with smoked ham, melted white cheddar cheese, tomatoes, onions, avocado, chipotle mayo and a cilantro dressing. It’s distinctive flavors will keep people downtown happy at lunch or when they take one home for dinner. The two vegetarian tortas are a roasted poblano peppers and Oaxaca cheese with pinto beans or an oyster mushroom stewed in a tomato-chipotle sauce with avocado and Oaxaca cheese. Fish is either Shaw’s famous red snapper Veracruz with olives, jalapeños and a caper sauce or an exquisite tuna melt with Gruyere cheese, avocado and sweet dill jalapeños. Shaw offers a roast beef torta with a Mexican twist and a chorizo cheese steak that tastes like a Philly cheese steak with Mexican flavors. His pulled pork is tender and juicy, as is his smoked Black Forest ham and cheddar cheese. There is a Caesar salad and Jicama slaw of the menu to accompany the Tortas. For those with a sweet tooth, the banana and Cajeta torta. Cajeta is a milk based sauce similar to caramel. For early risers wanting to take breakfast to their desk, there are three breakfast tortas to get you going until lunch. 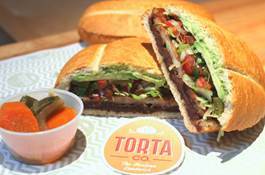 Located at FIG at 7th, Loteria Grill and Torta Company will be a spot you visit often when downtown at work or shopping. Go to: Tortacompany.com.